Enlarge / Cutting edge at the time, we swear. Doom (1993): Doom’s success lay not only with its addicting gameplay and technical innovations, such as its introduction of a portable game engine, but also in its innovative digital distribution. Note the prominent “shareware” advertisement on the top front of the game packaging. This groundbreaking game earned a spot in the inaugural class of the World Video Game Hall of Fame. In the early 1990s, the video game industry was still dominated by that Italian-American plumber named Mario. The gaming giant Nintendo was not just restricting the number of third-party titles that could be released for its NES and SNES consoles, but it was also enforcing a strict moral code for its games. The SNES port of the wildly popular (and gratuitously violent) arcade game Mortal Kombat, for instance, replaced blood with sweat and substituted the game’s notorious fatalities with decidedly less violent “finishing moves.” Many game designers felt suffocated by Nintendo’s sanitized ecosystem and began returning to the wild west of video game development, the personal computer, to create exciting new games that challenged graphical and moral boundaries. Then, in 1993, a space marine blasted his way through hordes of invading demons, blazing a new path for games in the process. id Software’s Doom was a seminal release in video game history, influencing the form, feel, and perception of so many first-person shooters that followed. Doom’s story begins with id Software, and id Software’s story begins with a company called Softdisk. Softdisk created disk magazines, which were electronic publications distributed on 5.25” floppy disks that provided readers with an interactive experience using graphics, games, music, and puzzles. In the late 1980s, computer programmer John Romero was working at Softdisk, creating games that would be included alongside magazine articles. One such game was Dangerous Dave (1988), which Romero created to accompany an article about the GraBASIC programming language. Dangerous Dave was a simple game heavily inspired by Super Mario Bros. in which players collected gold cups and defeated monsters. This feature is excerpted, in slightly modified form, from the new book A History of Video Games in 64 Objects from the Strong Museum of Play. The book debuted this week on May 29, and it is available in all the usual locales: through the publisher (Harper Collins), book stores, online retailers (as a book or in e-formats or audio formats), and at the Museum’s gift shop. While working on Dangerous Dave and other titles, Romero’s friend and fellow programmer John Carmack developed a novel way to produce rapid side-scrolling graphics called adaptive tile refresh, allowing developers to compensate for the relatively poor graphical capabilities of early ‘90s PCs. Thrilled with the possibilities, Romero, Carmack, and their coworker Tom Hall spent evenings creating a knock-off version of Super Mario Bros. 3 for the PC, substituting Dangerous Dave for Mario; they later dubbed it “Dangerous Dave in Copyright Infringement.” Hoping to convince Nintendo to bring their games to PC, the trio put together a working demo of Super Mario Bros. 3, but the Japanese gaming giant promptly turned them down. But their technological breakthrough caught the attention of an entrepreneur named Scott Miller, who encouraged them to publish original titles with his company, Apogee Software. Working in secret using Softdisk’s computers, Romero, Carmack, and Hall produced the side-scrolling platform game Commander Keen in 1990 for Microsoft’s MS-DOS operating system, the precursor to Windows. The game was an immediate success but invariably caught the attention of Softdisk, who claimed they owned Commander Keen’s intellectual property. In a legal settlement, Romero, Carmack, and Hall agreed to leave Softdisk and license it a number of video games. In February 1991, the three friends formed id Software, short for the phrase “in demand.” The company’s Commander Keen titles were distributed via shareware—demo software that is free to play and distribute but must eventually be purchased to unlock full functionality. They also detached the game’s core source code, known as the “engine,” and licensed it to other companies. This practice would later become a core feature of id’s business model. After the success of the Commander Keen series, id poured its resources into Wolfenstein 3D. Released in May 1992 for MS-DOS, players assumed the role of an allied spy during World War II who must battle Nazis and escape from a castle. Wolfenstein 3D was a massive success for id, selling more than two-hundred thousand copies by the end of 1993. While most of the id team was focused on Wolfenstein 3D, John Carmack was hard at work on a more ambitious project. Wolfenstein 3D had featured impressive graphics, but they were very limited: the shadow textures were crude, doors and walls were mostly uniform colors, and there were no sloping surfaces. Enemies in Wolfenstein 3D were never below or above the player, and nearly every level looked alike. Carmack wanted id’s next game to feature bright and dark textures, curved passageways, elevators, and other elements that would truly make the game three-dimensional. After the release of a Wolfenstein prequel called Spear of Destiny, production on Carmack’s project began in earnest. One idea was to license a game based on the hit science-fiction thriller Aliens, but id abandoned negotiations with the movie studio, 20th Century Fox, when it became clear its creative vision would be severely restricted. Instead, Carmack decided to make their next-generation game a mashup of Aliens, the cult-classic B movie Evil Dead II, and a failed Dungeons & Dragons campaign in which demons overran Carmack’s team. The game, which id dubbed Doom, would also feature an intricate story. Unlike Wolfenstein 3D, whose Nazi-battling gameplay was essentially plotless, Doom was developed with a compelling backstory: A base operated by the Union Aerospace Corporation on the Martian moon Phobos is overrun by demons from Hell after its top-secret teleportation experiments go awry. A detachment of space marines is sent to investigate, but all are slaughtered except for one. It’s up to the player to fight through the horde of demons on Phobos and, eventually Hell itself, to prevent a massive invasion of Earth. In developing Doom, id’s programmers made a number of crucial decisions that affected the future of gaming. First, they employed a first-person perspective they had developed for earlier titles such as Wolfenstein 3D, powered by a highly efficient graphics engine, the id Tech 1. By using smart programming techniques and simplified design choices to maximize speed, Doom’s creators achieved texture-mapping and lighting that had never before been achieved for PCs. Even more significantly, by separating the game engine from many of Doom’s artistic assets, the creators gave players the ability to heavily modify the game. 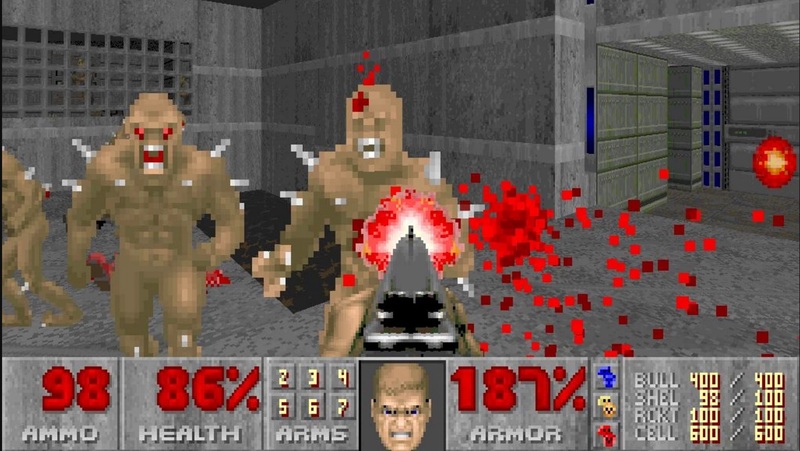 Doom also pioneered online multiplayer gaming over DWANGO—Dial-up Wide-Area Network Game Operation—service, which launched in 1994, though the most popular (and most fun) way of playing was to have a LAN (local area network) party in which players tethered their computers and blasted away at each other. The game’s multiplayer “deathmatch” play contributed to the game’s ongoing success and spurred on the popularity of multiplayer titles. Doom’s creators also tapped into newly emerging trends in digital distribution by making the first three episodes of the game available for free and then asking users to pay for further levels. By bypassing the traditional retail outlets and hooking players with a substantial body of free content, id became an early leader in a business model that today dominates much of the video-gaming world, especially in mobile, where “lite” versions of games provide players with incentives to purchase more content. And yet even as Doom’s technical features and distribution model broke new ground, in many ways it harkened back to older forms of play. Kids have been playing imaginary first-person shooters in the backyard for decades—cops and robbers, cowboys and Indians, and war games of all kinds. And yet Doom’s bloody battles with demonic monsters alarmed critics and politicians already on high alert about media violence. Although research still does not support claims that playing video games increases the propensity for real-life violence, Doom became emblematic of the debate over the role of games and violence in society, especially in the wake of the 1998 Columbine shootings, after which investigators discovered that the two gunmen, like tens of millions of other people, had played the game. Doom was more than just a technically proficient game with a smart business plan. Its thematic, visual, and ludic elements hooked into players’ minds and culture as a whole. The game’s bloody battles with demonic monsters were set to the score of a heavy metal soundtrack that fueled players with adrenaline and critics with outrage. It brought players to hell and back—and in the process forever changed how we experience games. Inspired by the groundbreaking A History of the World in 100 Objects, The Strong Museum’s new book draws upon its video game collections housed at the Rochester, New York destination. It chronicles the evolution of video games, from Pong to first-person shooters, told through the stories of dozens of objects essential to the field’s creation and development—like the original Doom cartridges.